Pioneers in the industry, we offer laparoscopic trolley from India. 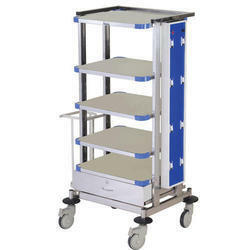 Mounted on 125 Dia Heavy duty castors 2 with brakes. Eight point electrical panel board with socket & switch. Available in Stainnless steel / Powder coated. Looking for Laparoscopic Trolley ?